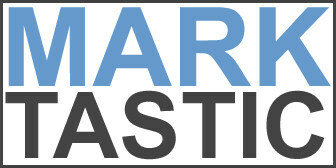 Marktastic » How To: Create One Partition on a 3TB Drive | It's not just Mark, it's Marktastic! I recently upgraded the hard drives in my home desktop and encountered a minor stumbling block that I thought I’d share with you all. My desktop PC is setup with 3 hard drives. The boot drive is a 1TB drive (C:). I then have two 1.5TB drives (E: and F:) which serve as the foundation for my long term storage and file shares. F: is simply a clone of E: via SyncToy. Parts of C: and all of E: then gets backed up offsite with Crashplan. Recently, the system has sporadically slowed to a crawl where it was unusable. While I rely on my laptop for actually getting anything done, this disruption reiterated to me the pivotal role my desktop PC still plays in my home computing infrastructure. After some fruitless troubleshooting, I found a smattering of bad blocks on both E: and F: via chkdsk. I was also running with only 10-25% free space on those massive drives. Fixing those blocks pepped the system right up, but I never like to keep crucial data on drives with bad blocks any longer than necessary. 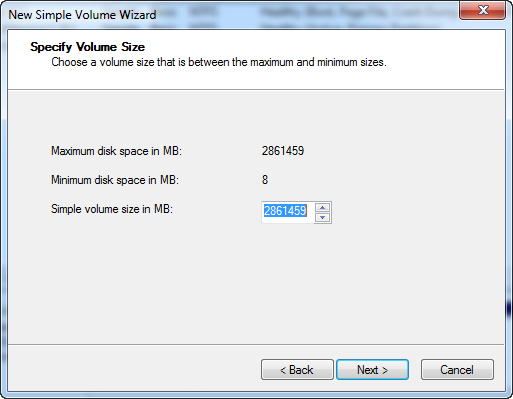 About 4 years ago, I splurged when I bought those 1.5TB disks figuring I wouldn’t ever fill them up. But I haven’t ever regretted having so much storage space. I took this opportunity to again expand my file storage capability by purchasing two Seagate 3TB disks. Once the drives arrived, I wasted no time in installing them and heading into Disk Management to get my new drives formatted and ready to go. 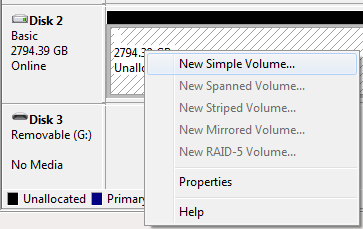 I’m met with a drive that shows 2 partitions that can’t be combined into a single partition. What in the world? Turns out, I’ve bumped into another barrier imposed by legacy technology. 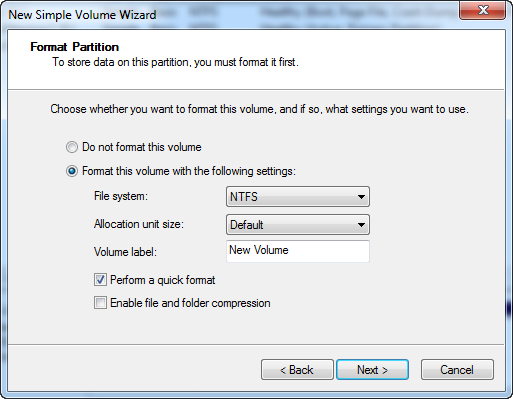 Master Boot Record (MBR) is the partition table format that has been used for what seems like forever. Built into the design of MBR is a hard limit of 2^32 logical blocks of 512 bytes or 2,199,023,255,552 bytes (2.19TB). GUID Parition Table (GPT) is the replacement of MBR. It offers 64-bit block addressing and has a maximum partition/disk size of 9.4 zettabytes. 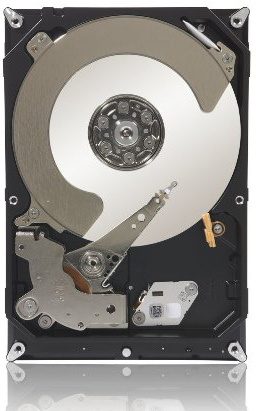 That’s one disk with 1,073,741,824TB on it. Holy. Cow. So while this is all fine and good and I know why I’m getting two partitions, what needs to be done to fix it? 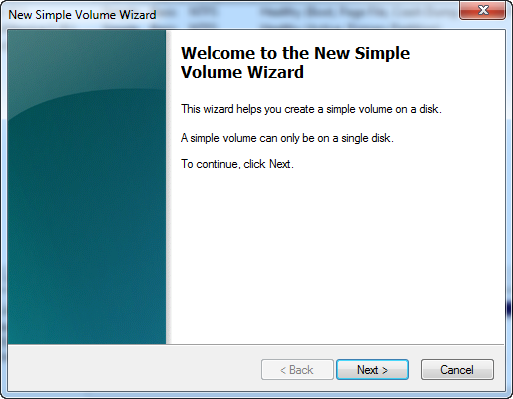 The great news is that Windows 7 64-bit supports GPT partitions just fine. 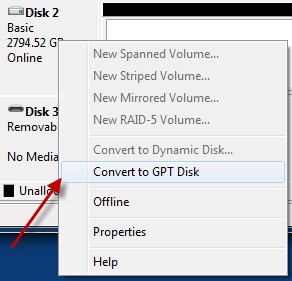 But how do you change your drive from MBR to GPT? I didn’t find the answer readily available when Googling. I’m sure it’s out there, but I didn’t come across it. I did however get lucky when I right clicked the on the Disk line while in Disk Management. 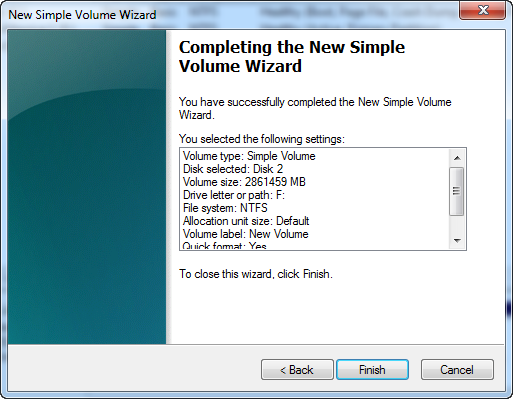 After the conversion to GPT and running through the New Simple Volume Wizard, I was able to successfully create one partition on my huge drive. There’s always a catch, which is that you can’t boot from a GPT drive without a computer that has a UEFI compatible BIOS. From what I’ve read, not many systems are shipping with a UEFI compatible BIOS at this time. 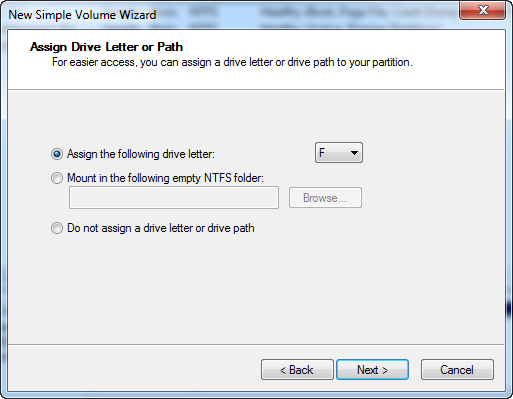 This was not an issue for me, but keep that in mind if you are planning on installing Windows to your huge drive. What happened to the Address Bar in Windows XP Service Pack 3? « Got a Gun? Then Get a Kholster.